On occasion, we've been invited, by other dog parents, to meet up at one of the local dog parks. We appreciate the invite, but no thank you We've never brought our kids to the dog park. And, we won't. Ever. We're not against dog parks. For a lot of pet parents, dog parks are convenient. It's a fenced in area, or allotted space, where the fur kids can run and play and get their exercise. Not everyone has a fenced in yard, especially those who live in the city. Some dog parents don't have yards at all. We have a fenced in yard. This is where our kids play, run around and get most of their exercise. They don't need to frequent other fenced in areas populated by other dogs and humans they don't know. The term dog park is somewhat enticing. When I think of the word park, I am taken back to childhood days of spending the afternoons in the park. A picnic. Lots of ground to run and play ball. Swings. Slides. Fun. Slip in the word dog, and it translates to an area in which your fur-kid can have fun. Run. Play. Interact with other park goers. Our mindset is that dog parks are the-place-to-be if you are a dog parent. It's luring especially if most of the dog parents you know are frequenting the local dog park. Sadly, while pet parents want to join in the fun and hoopla, it's often the fur-kids who pay the price. Why? Because dog parks are kind of a bad idea all the way around. Let's start with the most obvious...a fenced in area. I'm sure, amid experienced dog trainers, there are professional terms for dogs who experience increased stress and tension when confined to a fenced in area. I'm familiar with some of those terms. I prefer to explain by example. Simply put, all three of our kids will bark at anyone who approaches our fence, while they're in the yard. If they are on a leash, outside of the fenced in area, they're fine. Maybe a bark or two, but that's it. The same holds true for fenced in dog parks. 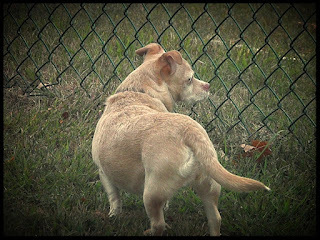 When you have a bunch of dogs and humans confined to a fenced in area, the tension and stress increases as more dogs and humans approach. Who's checking to verify all dogs are UTD (up to date) on vaccinations and free of contagious health issues? I'm going to assume there's a sign posted with rules and such at dog parks. And, on the list, I would hope, would be that all dogs must be UTD on vaccinations. While signs are visible and legible, they're just signs. There is no guarantee that every dog entering the dog park is up to date on vaccinations and relatively healthy. Who's checking and verifying this? If you think I'm being hyper paranoid, let me bring one word to the table. Giardia. Dogs are infected with Giardia by ingesting infectious offspring cysts that are shed in another animal's feces. This can happen from direct or indirect contact with the infected cysts. In other words, if a pile of infected feces is sitting in a puddle, and your dog tromps through the puddle and, later, licks their paws, they can become infected. Once these nasty little parasites are ingested, they make their way into the intestine, often causing diarrhea, vomiting, weight loss, or death. Dogs are also taxis for other issues including, but not limited to, parvo, canine influenza, fungal infections, intestinal parasites, fleas, mange, and kennel cough. Let me set the stage. If your fur-kid was at the dog park with other dogs and there was an altercation because some asshat brought a toy or treat, despite the rules etched in the Welcome To The Dog Park sign, would your fur-kid come to you when called? I'm not talking about recall when you're in your yard or other familiar setting. Dog park. Multiple dogs. A dozen or so distractions that could trump you belting out your fur-kid's name. Will. Your. Fur-Kid run to where you are? If you say no, your fur-kid should not be unleashed at a dog park. Too often, too many dogs are not properly trained with recall. And, even with training, with some, recall is just not happening. That's easy to do when you're not paying attention. For all the parents to human kids, think back to the last time you were at the playground with your kids. Did you notice any parents glued to their tech devices or talking with other adult humans? And, maybe, when you witnessed this, you thought, "Why aren't they paying attention to their kids? It only takes a second for..."
The same thing happens at dog parks. Not all dog parents are paying attention to their fur-kids or the other fur-kids and humans. They're too busy texting about their dinner plans. Checking emails. Socializing with other dog parents who aren't paying attention. When you've got your eyes glued to your iPhone or Kindle, you're not paying attention to potential dangers. I'm reminded of a story a friend of mine told me a few years ago. She had been at the dog park with her fur-kid. It was crowded. She got a call. A client. While speaking to her client and doing whatever she was doing, there was an altercation between several dogs. Hers included. A dog parent had brought a toy. Huge no-no, but apparently that day, the rules didn't apply to them. My friend's fur-kid was enticed by the toy and took it. One thing led to another. Long story short, altercation. The dog parents attempted to recall, there was yelling, etc. Not a good mix. At all. While my friend was telling me this story, I compiled a lengthy list of everything that had gone wrong, had been handled wrong and could have been prevented. My friend was oblivious to how she had partaken in the entire mishap. How could she have possibly been at fault? She wasn't the one who ignored the rules and brought the dog toy within the confines of the dog park. Surely, the human who did was entirely at fault. Put a dozen or so humans with this mentality at a dog park and see what happens. The pet parents who aren't prepared for the unexpected. I don't care of your fur-kid is 12 years old, has never bitten a single soul and has the most gentlest of temperaments. Trying to convince yourself, and others, your dog will never bite is another disaster waiting to happen. When you are at a dog park, you are around other dogs and humans that are both unfamiliar to you and your fur-kid. Strangers. The unexpected should always be expected in these types of environments. Sure, maybe your fur-kid has always gotten along well with large dogs, but what if this one large dog is the one they happen to not get along with. By convincing yourself that your-dog-will-never is only letting your guard down. You are too overconfident. That's when things can spiral downward. Quickly. Within a split second. My listen of reasons lingers on, but you get the gist. Other factors are small human kids roaming the dog parks, large and small dogs mingling together (although some dog parks have separate play areas for large and small breeds), humans who take the pup they just adopted, the day before, to the dog park, etc. The great dog park debate reminds me of the one surrounding retractable leashes. This group swears by 'em. That group is completely against these type of leashes. People sway from one side to the other. Some linger in the middle. That's okay. We're all entitled to our opinion.